In Stock Molded Fiber Products - Henry Molded Products Inc.
Henry Molded Products offers in stock molded fiber products which are available at any time. 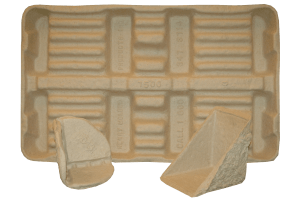 From corner protectors – to molded fiber pallets – to wine shippers, we can meet your on-demand shipping needs with our in-stock products. All of our products are made from 100% recyclced materials and are biodegradeable. Each and every one of our products are friendly to the environment.